The folks at Wente Vineyards in Livermore have a secret up their sleeve. Just a short drive down the road will deliver you to a small intimate vineyard called Murrieta's Well. First of all, it is run by the folks at Wente Vineyards, so you can be assured that the food, service, and of course the wine will impress even the most "foodie" couple. The size of the venue is also one of it's biggest draws. A winery or wine country wedding is commonly associate with a large scale event. This location is perfect for the mid-sized intimate affair. Murrieta's Well is perfectly sized for a celebration with approximately 80 guests. The rustic and charming qualities of the vineyard and barrel room speak for itself. There is little need to go overboard with decor. Simple is the way to go. Think about using some great linens that will stand out against the stone and weathered wood facade. When working with the barrel room, consider one thing: lighting. This is the crucial detail to make the room stand out. Candles and up lights will work wonders. A simple gobo wash on the room is a great way to bring in your color palette. 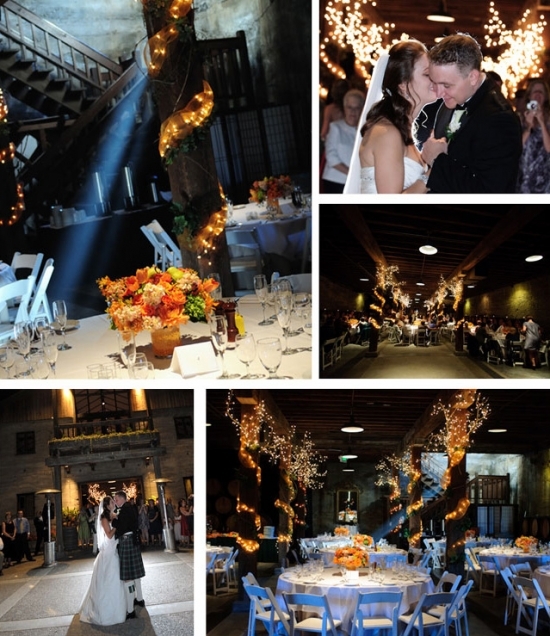 Creating a soft glow in the barrel room will set the stage for a romantic wedding dinner. When you choose a wedding venue, an incredible aesthetic is a great asset for your photography, especially if the location has a wide variety of backdrops to choose from. This venue is a perfect example - your guest will enjoy the warm setting sun over rolling vineyards as you exchange vows, followed by a light and airy outdoor courtyard setting for your appetizers and cocktail. Then allow your guests to enjoy the drama of an authentic barrel room as you move indoors for the remainder of your celebration. A venue like this helps create natural flow, always giving your guests something to look forward to - and something for your photographer to work with!